Two months ago we fell in love with this guy at a reptile show. Didn't know much about the species at the time and have been doing some research. 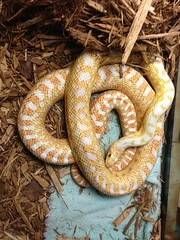 The seller only said that he was an albino gopher snake. Was wondering if anyone could tell us more specifically what he is. I'm not usually one for impulse buying, but he had such beautiful coloration and a great personality. We couldn't pass him up.